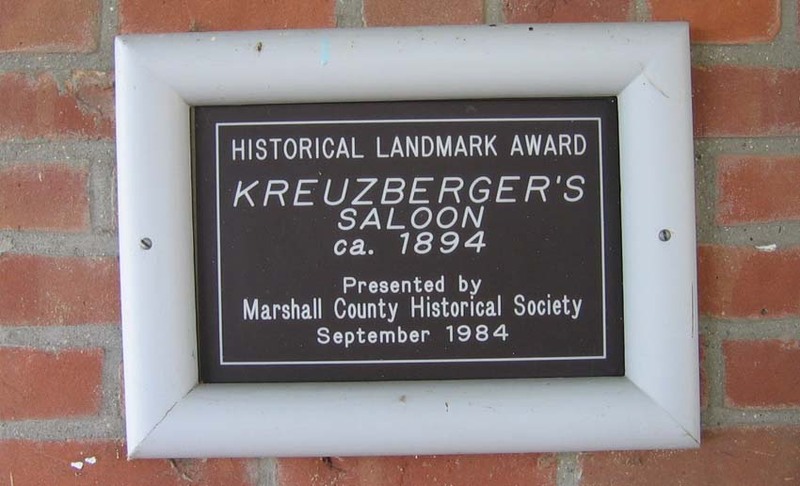 The Kreuzberger Hotel and Saloon was one of the more prominent businesses in Culver, even in the days when the town was called Marmont (before 1895). It was located on the west end of what is today the Town Park, and the main building still stands and has been restored to beautiful condition by various owners over the years. The adjoining park area, which included other buildings as well, was gradually sold off over the years and is now occupied by private homes along Lake Shore Drive (called Toner Avenue in the earlier years of the hotel's existence). Below: the hotel and park as they appeared in 1898, and (at right) an advertisement for the park and hotel that same year. Below: a platt map of the lots making up the Kreuzberger Park area. Notice the street named "Toner Ave.," which today is Lake Shore Drive. 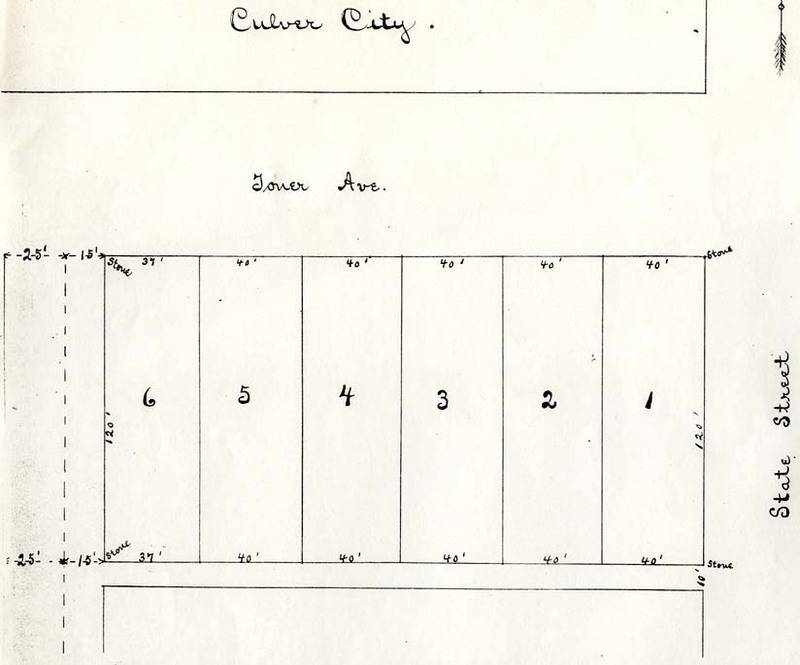 The image at right is Robert Kreuzerger's own description of the lots, known then as "Kreuzberger's Addition." Below: R.F. 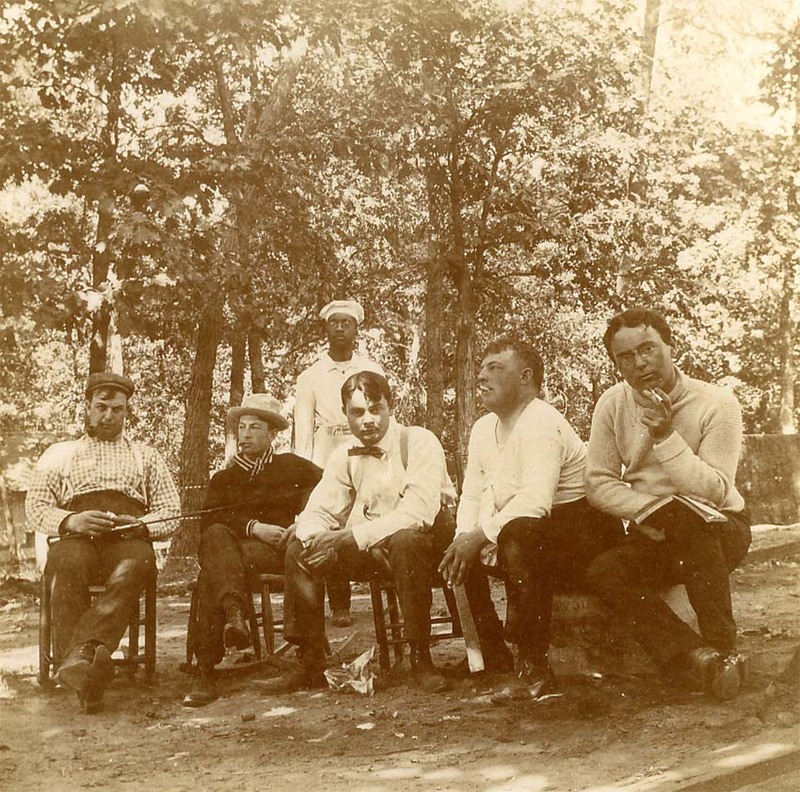 Kreuzberger and crew at Lake Maxinkuckee, September, 1897. This photo, part of Bob Kreuzberger's collection, shows hotel owner Robert Kreuzberger's son, R.F., and a handful of Logansport friends. On the back of the photo: "Mout Swigart, Claude Wisr, Rob Kreuzberger, Charley Rains, Chef, John Coulson, Tom Durer." 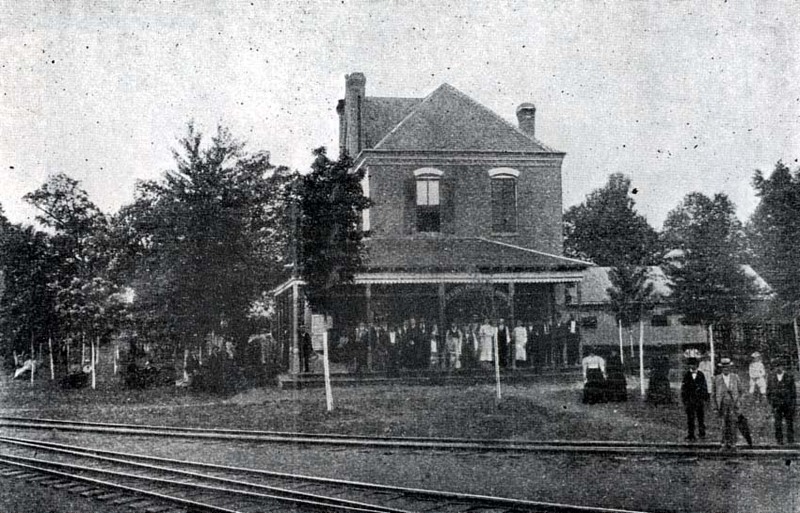 Note the wooded appearance of the park area at the time (this would most likely have been the area west of the hotel, rather than the Vandalia railroad park to the east). 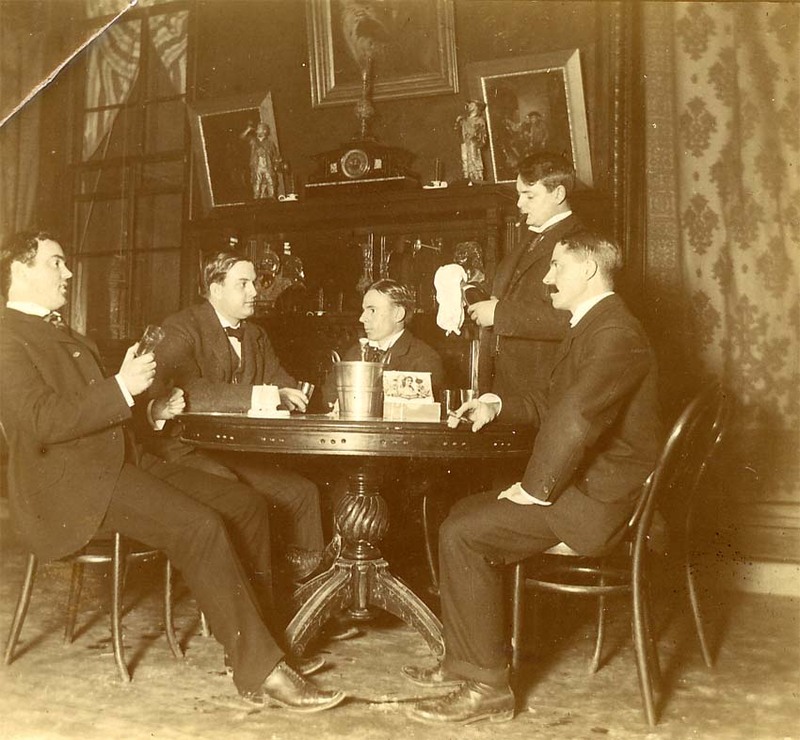 At right: the same group of friends in June of 1897 at one of Kreuzberger's establishments in Logansport. 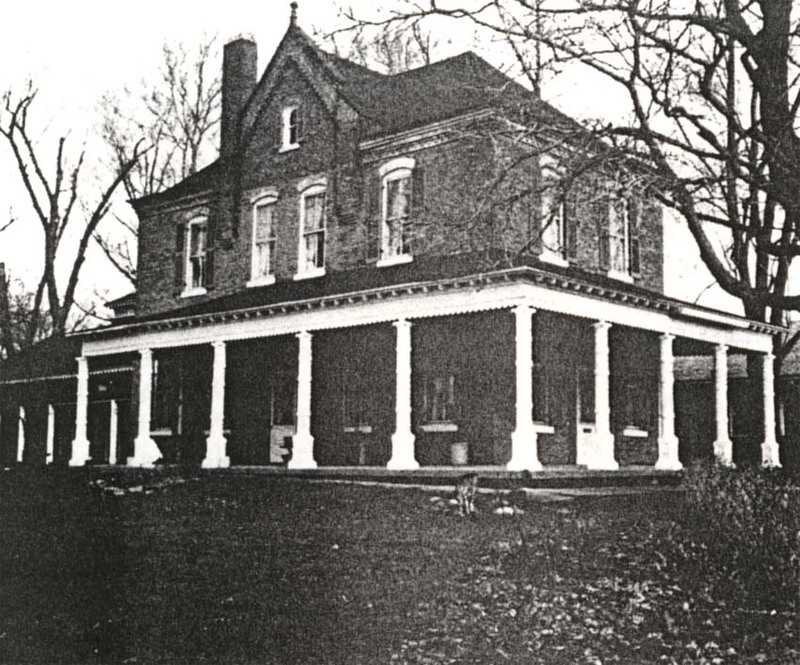 Below: the house in more recent years. 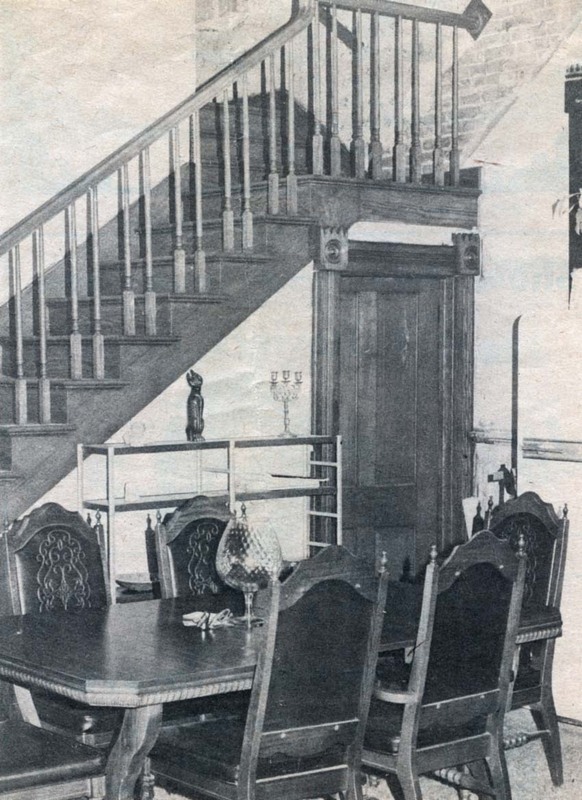 The two images at left, from a 1976 Culver Citizen article (click to read) on the new owners of the house, show the restoration work done by the Dale family who had just purchased it. 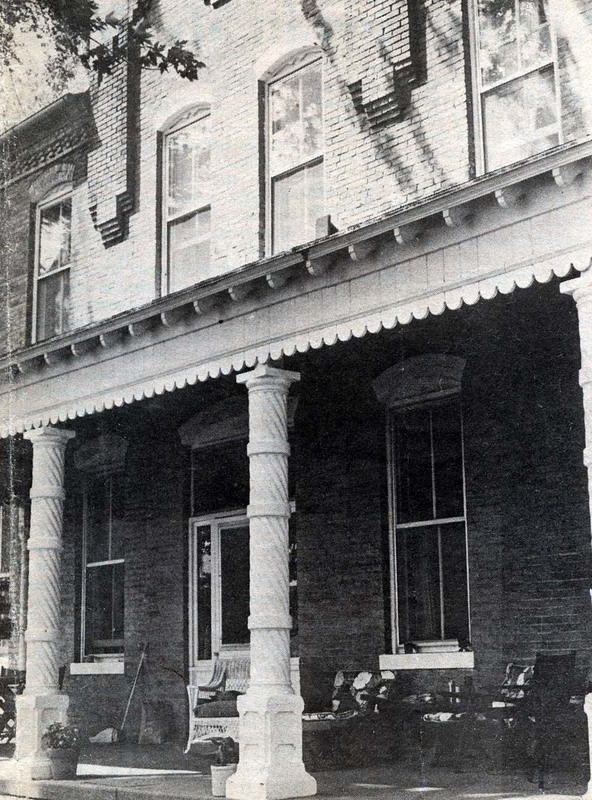 The photo at right shows the house as it appeared in 1985, 101 years after Kreuzberger purchased it. 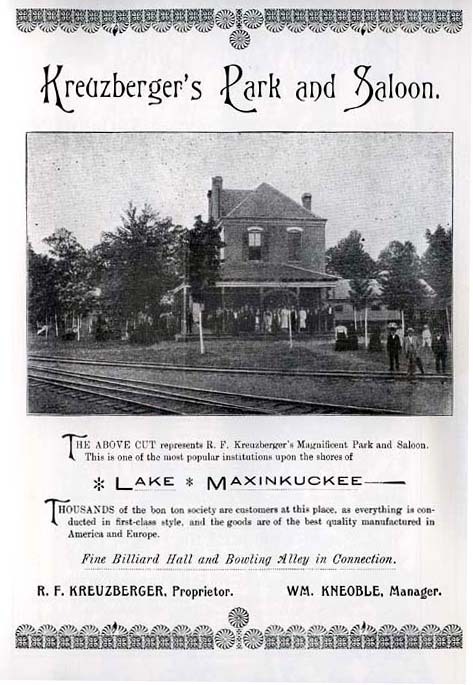 Robert Kreuzberger purchased the land and building that became Kreuzberger Park in 1894. His son, R.F. Kreuzberger, ran the business after him, and it went through many changes over the years, as is reflected in the articles below. 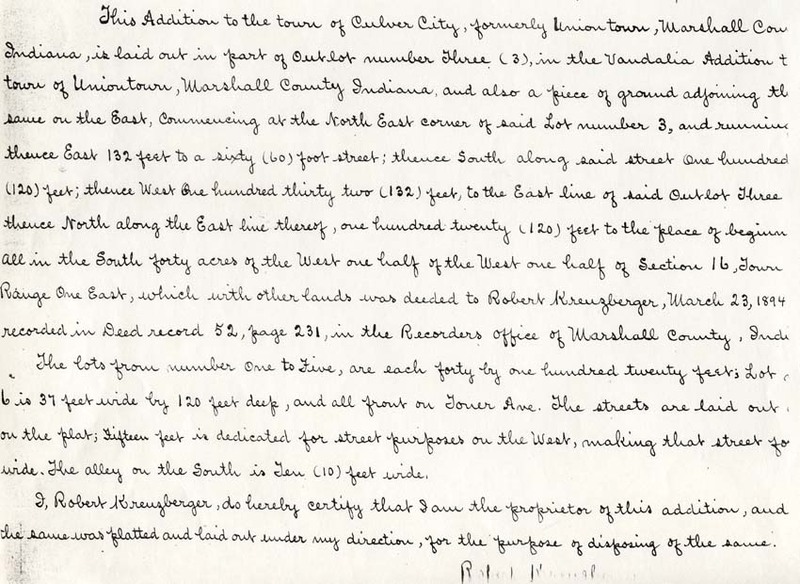 (This article is a reprint from The Marmont Herald, Culver's first newspaper, and is of interest as a reminiscence and an accurate study in local ancient history). This park is situated upon the west side of Maxinkuckee Lake, and presents a grand panoramic scene in nature and art. The park grounds are covered with magnificent shade trees and pleasure seekers can enjoy the cool breezes of the lake while reclining upon rustic seats, hammocks, etc. 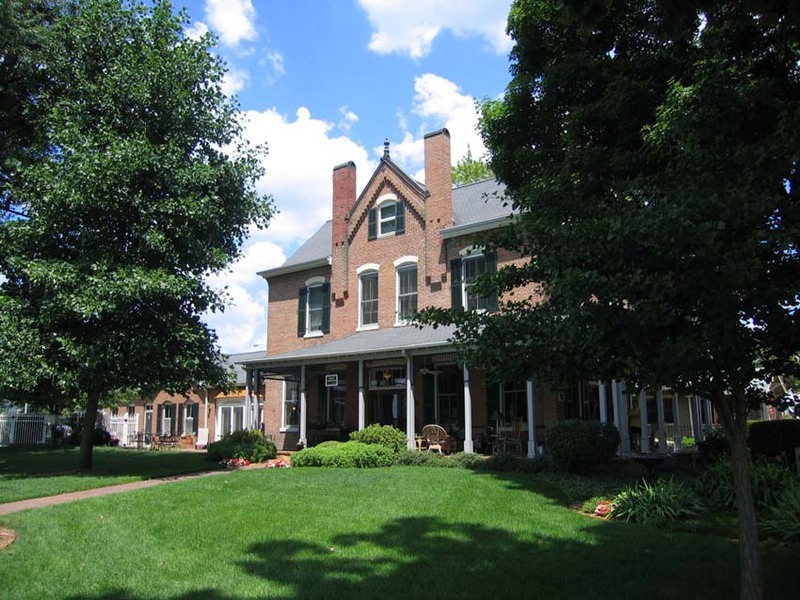 On the grounds are situated Kreuzberger's wine pavillion, beer garden, pool, billiard room, and bowling alley. 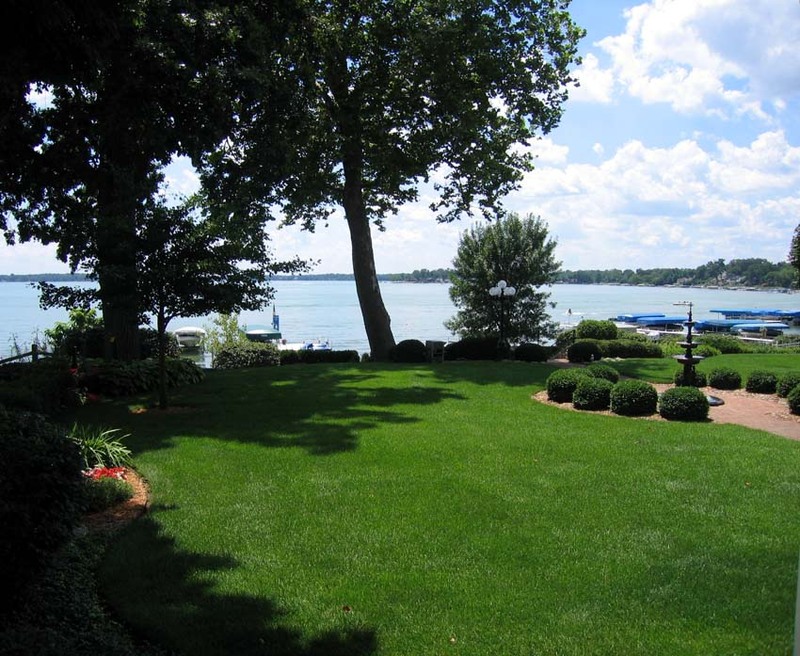 This is one of the finest places on the lake, and is visited by the elite of all cities. Here can be found Kreuzberger's celebrated wine room, where nothing but a first class article can be had. The business is carried on under the able management of J.R. Watson, a man of years of experience as a caterer. Behind the bar can be seen daily, William Knoble, of Indianapolis, who has an enviable reputation as an expert bar tender. No card playing or gambling is allowed at this place, and everyone is assured of the most courteous treatment. What was once a combination saloon, bowling alley, billiard hall and haven for "fancy ladies" is now the home of Mr. and Mrs. Harry Dale. 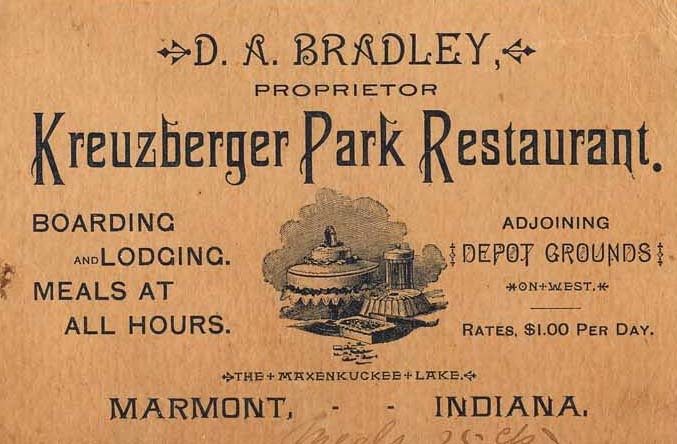 The Dales bought the old Kreuzberger's Park and Saloon 21-2 ago. 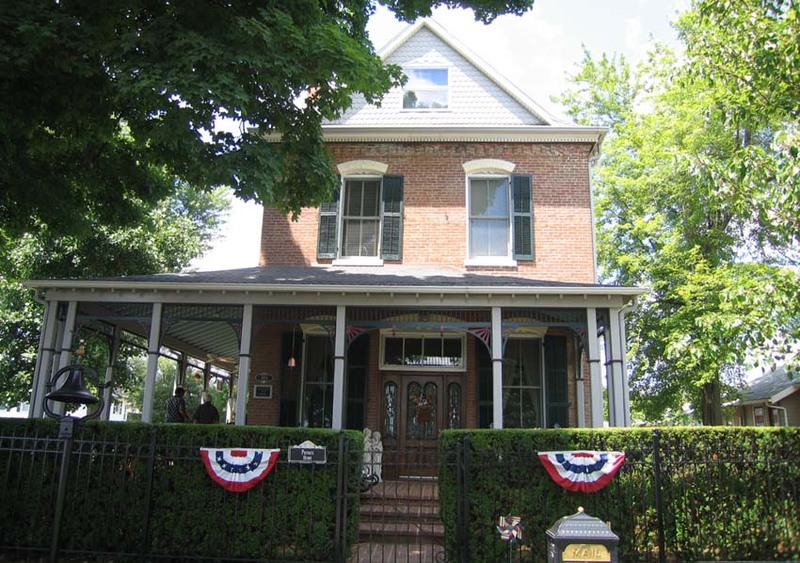 known as "Old Brick," it had been converted into an before the Dales apartment complex for two families bought it and before that it was used as a boarding house. Restoring the house has been the Dales' plan. Mrs. Dale said when they first bought the house they figured it would take five years to restore it and make it com­fortable. After two years, they have come a long way. "We're going to beat the five-year plan; we're getting down to just decorating and some electrical now," Mr. Dale said. The first major accomplishment the Dales achieved proved to be their first major setback. When they bought the house, there was no heating unit. So they installed a baseboard heating system and started drying the house out, said Mrs. Dale. "We thought the ceilings were in good condition but when the house dried out, the upstairs ceiling fell in," she said.... (click here to read the entire article). 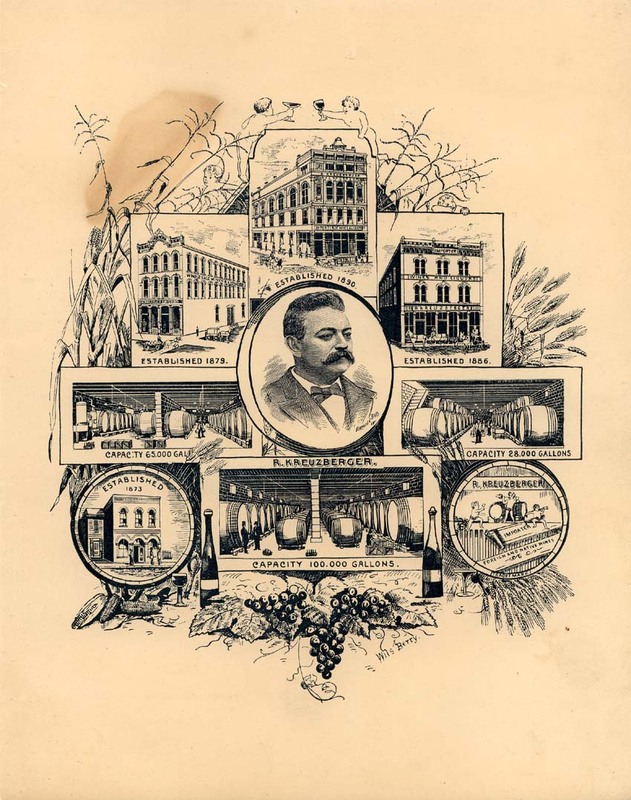 Mark A. Roeder's article on the Kreuzberger Hotel is here. Special thanks to Bob Kreuzberger of Culver's Antiquarian and Historical Society, great-grandson of the Robert Kreuzberger who owned the hotel, for the use of his artifacts, photos, and information on the history of the building. 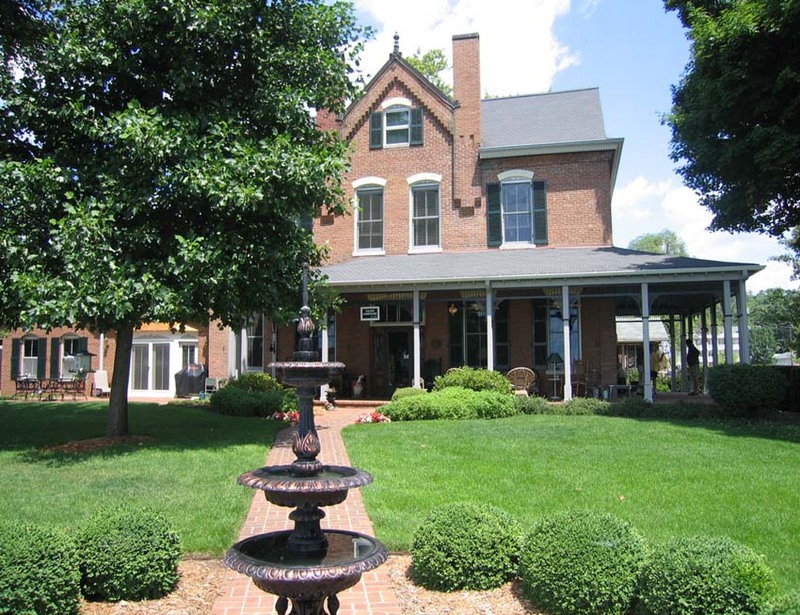 Special thanks also to Mr. and Mrs. Jim Greene, present owners of the house, for all of their help and hospitality. Also, thanks goes to the Culver Citizen, whose articles we reprint here by permission. 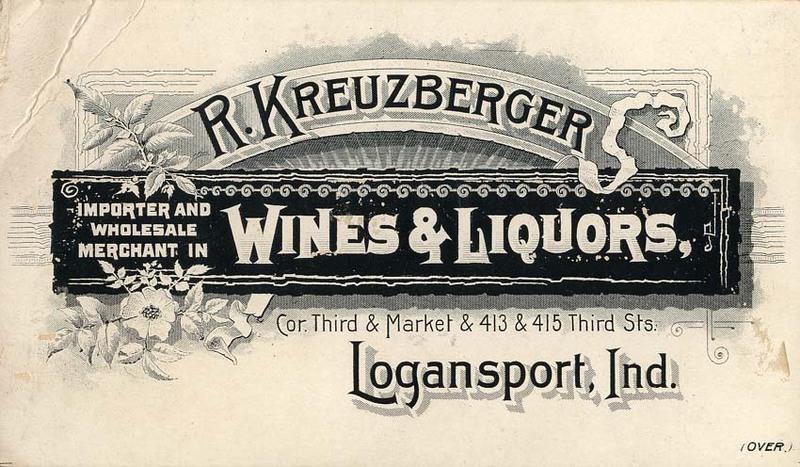 Robert Kreuzberger came from Germany to Logansport, Indiana in 1867, establishing several successful ventures in the Logansport area. 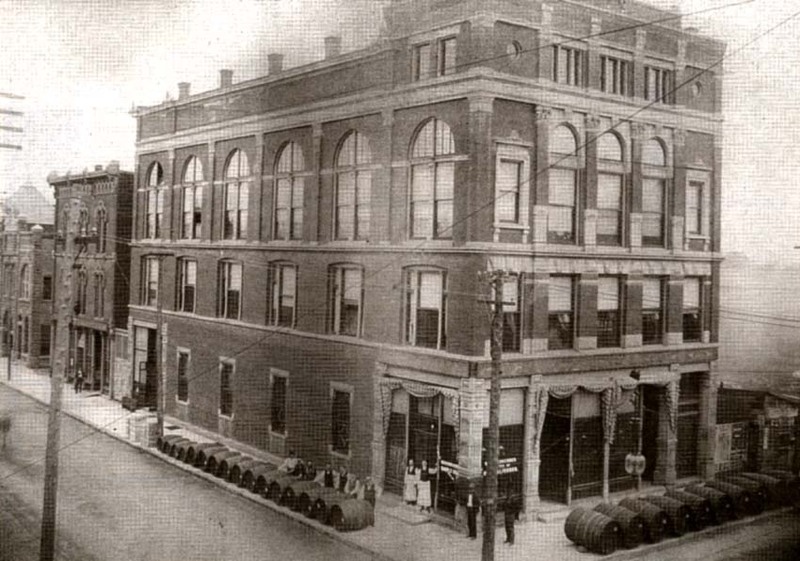 He was most prominently known as a dealer in wines and liquors, supplying local churches in Logansport with communion wine, and operating his own wine cellars and saloons in Logansport as well as Culver. Below: a business card, front and back, of Robert Kreuzberger's. 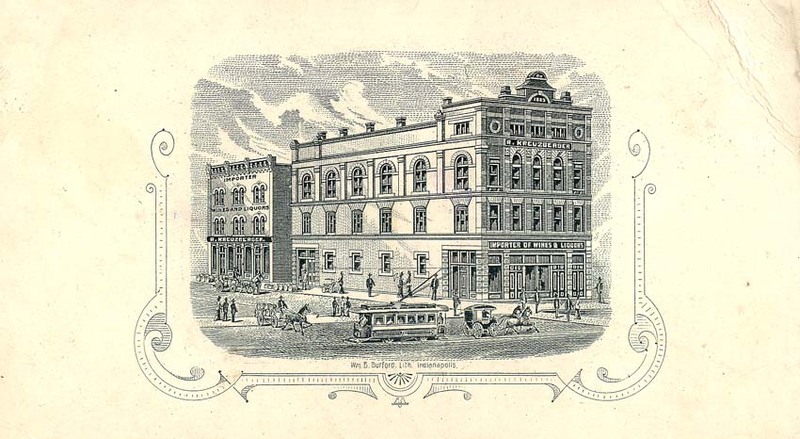 On the back (at right) can be seen a drawing of his most well-known and largest building on the corner of Market and Third Streets in Logansport. Below: Barrels of Rhine and Mselle wines arrive in 1899 for the semi-annual importation of wines to Mr. Kreuzberger's building, which housed a huge wine cellar. 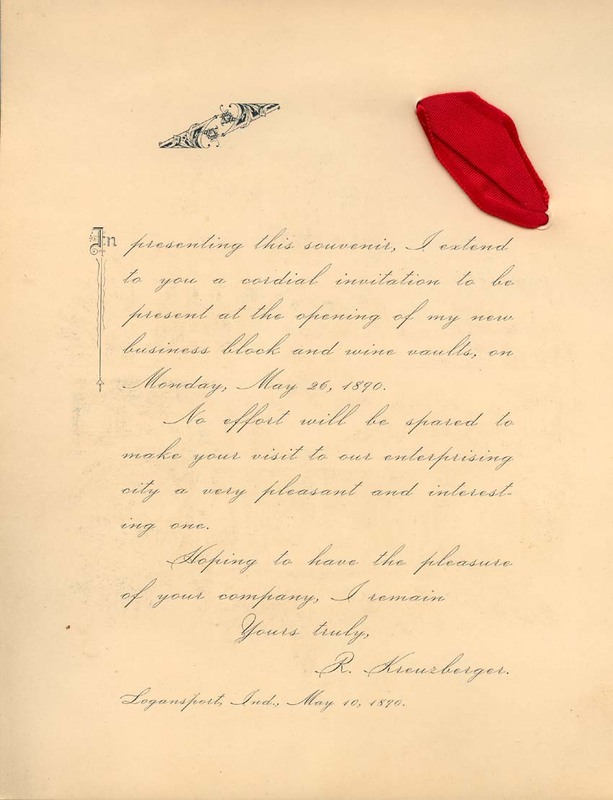 Below: a souvenir program for opening of Kreuzberger's "new business block and wine vaults on Monday, May 26, 1890." 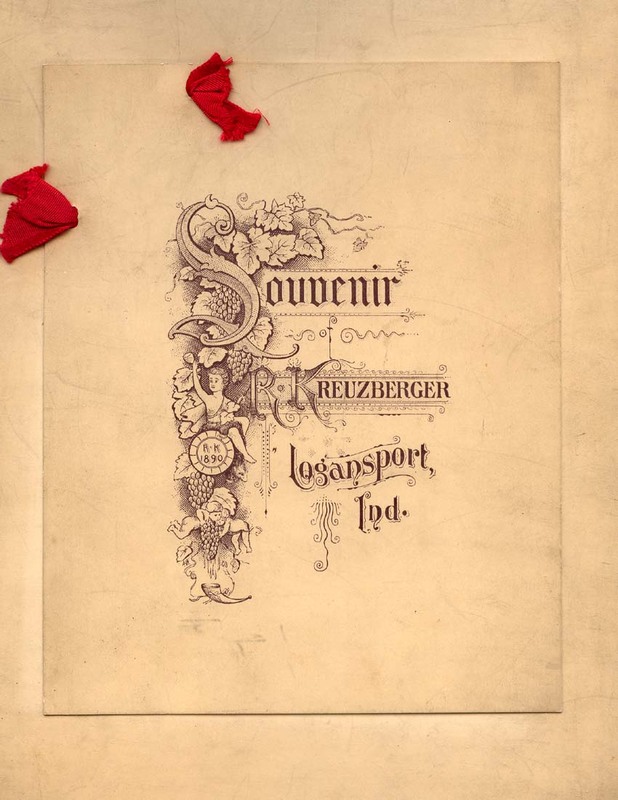 From left: the invitation's cover, the invitation itself, and most interestingly, a drawing showing the several Logansport buildings Kreuzberger owned. In the center is the only known picture of Robert Kreuzberger himself. 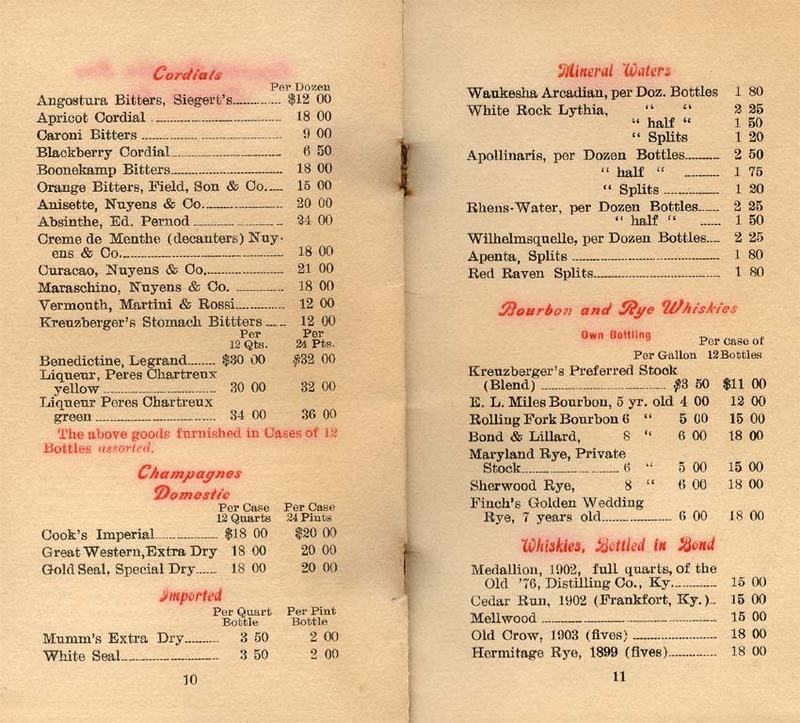 Below: the front cover and one interior page of a price list for wines and liquors offered by Robert Kreuzberger. 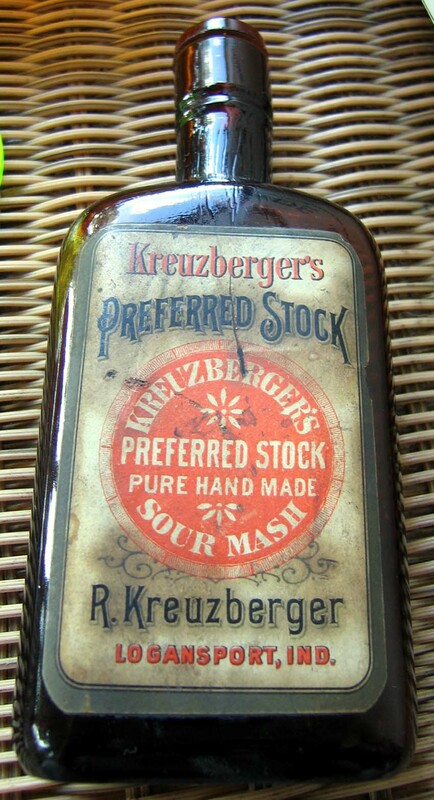 Of interest on this page is Kreuzberger's Preferred Stock, apparently Mr. Kreuzberger's own brand of drink. Bob Kreuzberger of Culver has a sample bottle, below. 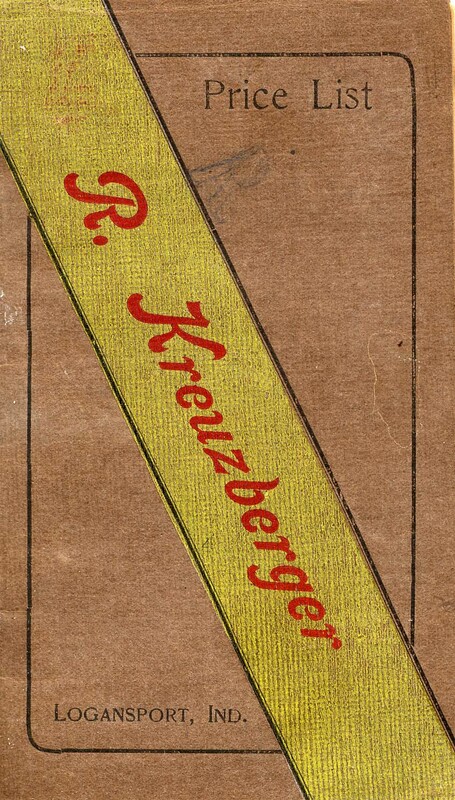 To its right, another liquor bottle imprinted with the Kreuzberger name. Presumably, this price list and bottles such as these would have been used at the hotel and saloon in Culver. 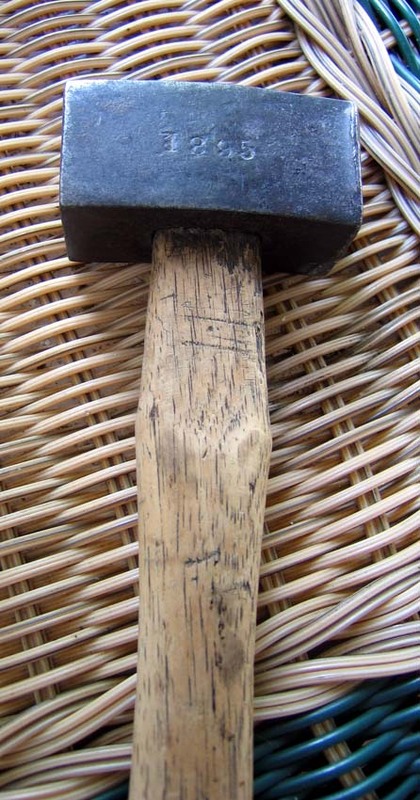 Other artifacts below: several shots of a mallot probably used in Kreuzberger's businesses to hammer shut the bungholes on kegs of wine. The name, "R.F. Kreuzberger" is imprinted on one side of the mallot head and the date, 1895, is stamped on the other. A letter opener bearing the imprint, "R. Kreuzberger, Altar Wine Merchant, Logansport, Indiana." 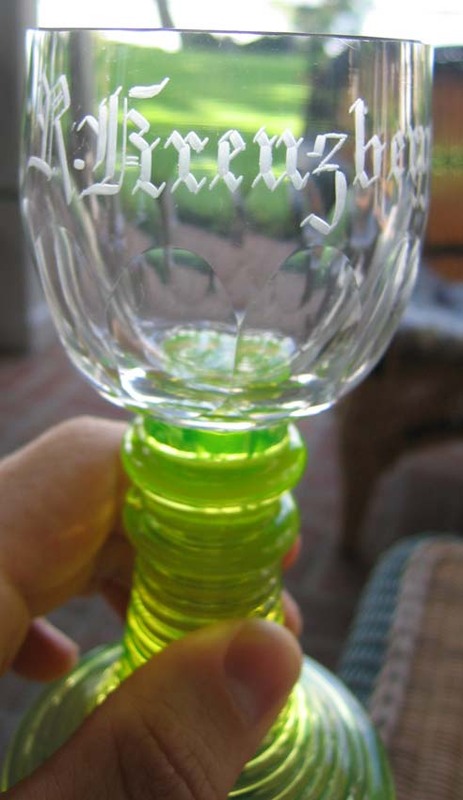 A wine glass imprinted with "R. Kreuzberger," again likely used at the hotel in Culver. 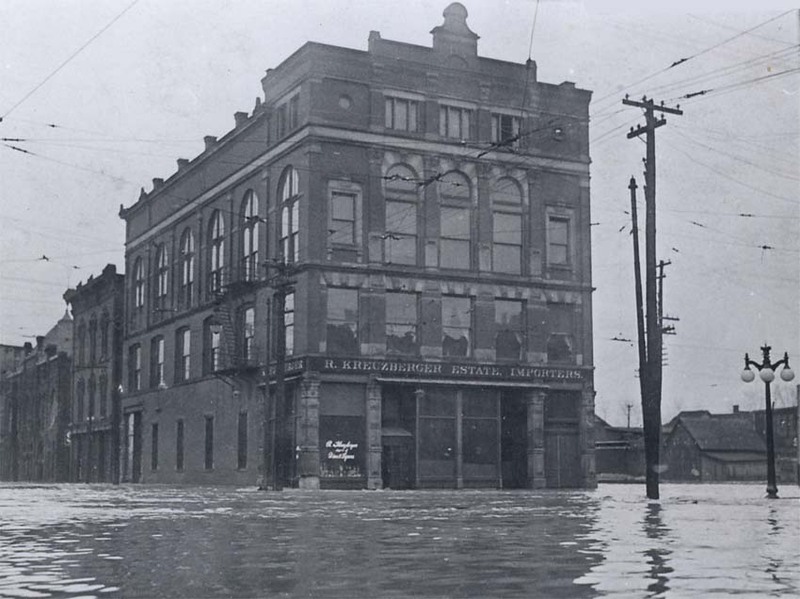 Below: Kreuzberger's most prominent Logansport building, on Market and Third Streets, as pictured during the infamous Logansport flood of 1913. This flood is famous in Culver lore for the rescue effort put forth by Culver Academy, which sent several cutters and cadets to retrieve stranded Logansport citizens. Of course, the famous Logansport Gate at CMA was a gift of gratitude from the city of Logansport. See story here. 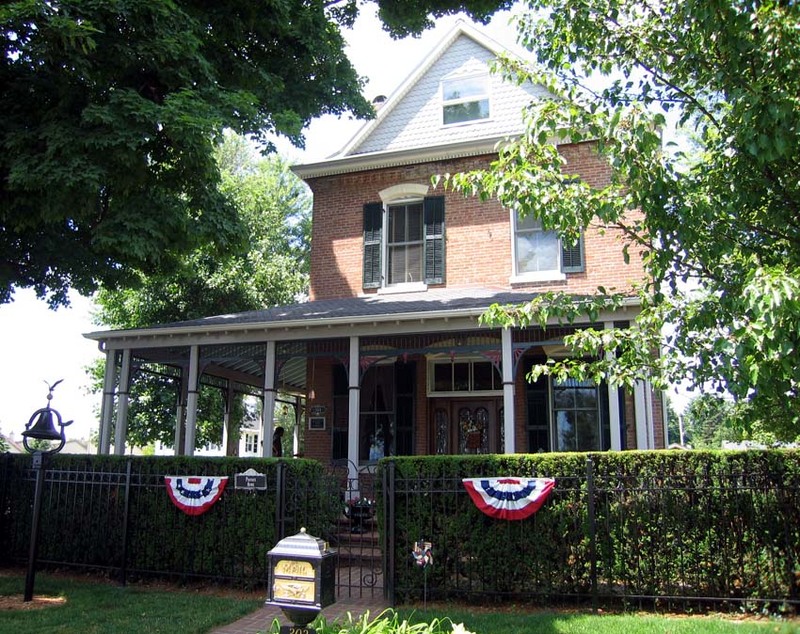 In September, 1984, the Marshall County Historical Society gave the building a historical award, which still hangs on the outer wall of the home today. What was once Kreuzberger Park Hotel, Restaurant, and Saloon, has been a boarding house and a private residence since. Today the home is owned by Mr. and Mrs. Jim Greene, who kindly allowed us to visit and take photos of the house. One of the interesting pieces of the building's history, also mentioned in the 1976 Culver Citizen article elsewhere on this page, is the natural spring that once ran through its basement. Apparently the cold water spring was used to cool the barrels of beer stored in the basement, but when the town of Culver went "dry" just after the turn of the century, the spring wound up being re-routed underground and no longer ran through the basement. Today, it can be seen pouring from a culvert on the lower trails running alongside the lake leading to the Town Park, just east of the end of Washington Street.